We’ve all seen it. Everyone in the team is working flat out, their eyes fixed on an impending deadline they can’t miss. Everyone that is, except one. This individual may be working just as hard as the others, or they may be actively disengaged, but their failure to meet defined deadlines is dragging down the rest of the team. At this point, most managers call a team meeting. Rather than singling out the underachiever, they address the whole team, hammering home the importance of meeting deadlines. That’s a kick in the teeth for those who gave it everything to deliver on time – and you can bet your last dollar they know exactly who the conversation is targeting. The obvious solution is to go directly to the source and tackle the problem one-on-one. So, why isn’t that our go-to response? Why do managers avoid one-on-one conversations? We all like to be liked. However, as leaders (and I don’t believe this is exclusive to CEOs), it is a mistake to put this natural desire above the needs of our teams. A one-on-one conversation may be unpleasant – and potentially damaging to your personal relationship with an individual – but by putting it off, you are failing in your role as a leader. In fact, a 2010 study found that every crucial conversation managers avoid costs businesses an average of 8 hours of productivity and US$1500¹. To put it simply, we can’t always afford to be liked. There is a lot riding on your ability to manage an underperformer. Studies have shown that supportive leadership and a high quality team climate have a significant impact on individual morale, helping to protect employees from work-related stress². Great managers are mindful of the impulse to avoid a difficult situation, but they don’t let it stop them from addressing the problem and finding a solution. Poor performance and missed deadlines are caused by many issues. A lack of ability and a lack of motivation are two of the most common. However, misunderstandings and poorly defined expectations are just as likely. Regular readers will know I’m a huge fan of SMART goals. Sustainable, Measurable, Attainable, Relevant, and Time-bound, these objectives make it clear to an individual what is expected and how they can achieve it. If employees are missing deadlines because of a lack of skills, poor organisation, or unclear expectations, then setting SMART goals is a great way to identify and address the problem. Reduce the threat: Individuals who are concerned about job security, your personal opinion, and their status can feel threatened. Make sure feedback conversations are two-sided and plan ahead to reduce these threats. Give the individual a chance to evaluate their own performance and devise a solution together. Be fair: An employee who consistently underperforms can be frustrating, but it is important to exclude your personal opinions from feedback conversations. Base your comments on facts rather than assumptions so individuals can see that your assessment is fair and unbiased. Focus on the future: Yesterday’s missed deadline is in the past. Keep performance conversations forward-focused and ensure individuals have the tools and support they need to deliver on their next objective. Performance management must be ongoing and integrated into workflows. These one-on-ones are not one-offs, and are just as important for star performers as underachievers. All employees need a sense of purpose, and performance management is key to aligning individuals with organisational goals. Clear direction at every level increases creativity, organisational performance, and individual engagement. Meeting one-on-one with team members gives them a chance to be heard. This means you can stay abreast of any potential performance issues at an individual and team level, and address them before deadlines are missed. That said, you can have too much of a good thing. Those of you who caught my article on the science of feedback will know that monthly feedback strikes the right balance between overloading and underwhelming employees. In fact, detailed monthly feedback on areas of weakness was shown to improve individual performance by as much as 46% (if you missed that article, now is the perfect time to check it out). Individuals who consistently miss deadlines are detrimental to the health of your team and organisational growth. The only solution for managers is to address the problem head on. If we want to avoid cynicism within the team, reductions in individual morale, increases in employee turnover, and reduced organisational performance, we need to overcome our personal distaste for difficult conversations and provide employees with the feedback they need to improve. https://www.cognology.com.au/wp-content/uploads/2015/07/Feedback-mechanism.gif 210 210 Jon Windust https://www.cognology.com.au/wp-content/uploads/2017/01/Cognology-logo-colour-300x101.png Jon Windust2015-07-07 07:19:352019-01-17 08:17:30What is a feedback mechanism? Learning how to manage is difficult. Overnight, you’re given responsibility for a bunch of people and somehow you need to deliver a result. It’s stressful, scary and can end in failure – for the manager, the project or both. I don’t think the process needs to be this difficult. There’s only a few skills – though I admit some will want to differ – that you need to be an effective manager of people. And all of these skills can be learnt and honed very effectively through managing small-scale projects with freelancers. With more freelancers in the economy than ever before, there’s plenty of opportunity. At the core of a manager’s responsibilities is helping their employees to learn. Employee learning is critical, because fundamentally every business result happens as a consequence of employees learning and refining their behaviour over time. Happy customers, financial results and high performance are all consequences of successful managers facilitating employee learning. Put simply, you cannot be an effective manager if you can’t help your employees learn. (Or, if you can’t facilitate learning, you will be an ineffective manager). As a result, the critical success factor for a new manager is how quickly they can build the skills to help their team learn effectively. How do you help others learn? When you break it down, this two-part ‘expectations / feedback’ process (repeated frequently over time) sits at the heart of all employee learning. In my view, an A1, gold-medal way to learn these two skills is through managing freelancers on small projects. If the project manager fails to set good expectations (that are easily understood and actioned) – then the project will fail. If the project manager fails to provides good feedback (that make clear actual performance versus set expectations) – then the project will fail. The success or failure of the freelance project provides an immediate feedback mechanism for the new manager. In a relatively safe and quarantined learning environment, the new manager can see the consequences of feedback and expectation setting for learning and project delivery. At the simplest level, to manage means you must be able to bring out the best performance in others, and drive learning in those around you to do so. In teaching someone how to manage, you must first teach them how to facilitate learning. As I’ve mentioned in this article, teaching emerging managers how to drive learning is extremely effective when they are managing freelancers on small projects. To deliver the project, new managers must learn how to drive learning through the expectations / feedback loop. It’s an investment that you’ll see pay off for the rest of their management career. Have you used freelance projects to teach new managers how to drive learning? I’d love to hear about your experiences. Jump into the comments below or join the conversation on Twitter (@cognology). 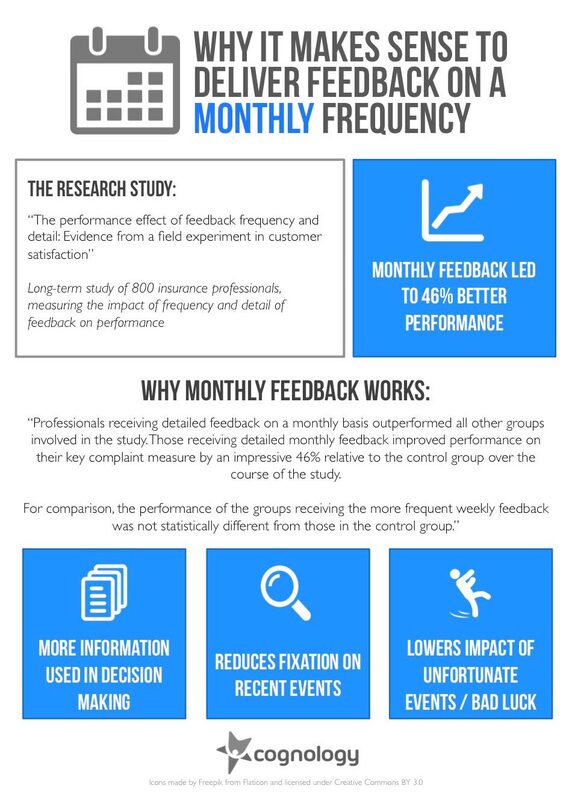 New research suggests the right frequency for feedback is monthly. Surprisingly, it shows more frequent feedback (weekly) overloads employees and reduces performance. What is the right frequency for feedback? Is more feedback always better? It seems that there’s a real desire from across the market to understand just how often managers should be giving their individual performers feedback – that is, what’s the optimum frequency to provide feedback. This hasn’t exactly been an easy question to answer for a long time. There’s been a lot of research, but not much conclusive evidence on the best frequency for providing feedback to your direct reports. Employees want more feedback, but you can overload them. Where is the sweet spot? In answering this question, we’re helped significantly by a recent study (March 2015) of 800 insurance professionals. The study is a relatively comprehensive look at the changes in performance of insurance professionals in response to feedback. Researchers varied both the frequency and detail of feedback that the employees received in order to assess the impact. As we’d expect, more feedback doesn’t always help to drive better performance (largely because employees reach a state of feedback overload, as we discussed last week on the blog). The researchers found that professionals receiving detailed feedback on a monthly basis outperformed all other groups involved in the study. Those receiving detailed monthly feedback improved performance on their key complaint measure by an impressive 46% relative to the control group over the course of the study. For comparison, the performance of the groups receiving the more frequent weekly feedback was not statistically different from those in the control group. “The results… suggest that providing more detailed feedback is useful for improving performance. However, that is only the case when feedback is provided sparsely. Detailed feedback loses its usefulness when provided very frequently. Similarly, providing more frequent feedback, even when it is less detailed, does not seem to help professionals improve their performance. Taken together, the results suggest that professionals fail to process the additional information rationally. The recipient of frequent feedback may fixate on the most recent information, leading him or her to underweight or ignore evidence that is more distant in time and thus limiting the amount of information actually used in decision-making. All in all, it’s a comprehensive and well-structured piece of research that has big implications for best-practice feedback and performance management. This feedback frequency is supported by the data we have available to us at Cognology (our software powers performance and talent management for over 250 Australian businesses). Looking across our client base, a monthly feedback frequency appears consistent with what we’re seeing from best practice clients. Whilst the amount and frequency of feedback continues to rise across our entire client base, our best practice clients are on track, hitting an equivalent monthly feedback frequency in 2015 (12 feedback events across the year). In the absence of further studies, I think it’s safe to say that best-practice feedback frequency for professionals is monthly. At a monthly frequency, you get all the benefits of enhanced performance through regular feedback, but don’t risk the ‘feedback overload’ that seems to happen with a weekly feedback frequency. I’d love to hear about your experiences setting the best frequency for detailed feedback. Have you tried weekly, monthly or quarterly conversations? What works best for your team and organisation? Understanding the right feedback frequency to get the most out of every employee is an exciting frontier as we move towards talent management for the future of work – so I’d love to get your input and thoughts. As always, you can join the discussion in the comments below or on Twitter (tweet your thoughts to @cognology). https://www.cognology.com.au/wp-content/uploads/2015/05/Frequency-for-workplace-feedback.gif 210 210 Jon Windust https://www.cognology.com.au/wp-content/uploads/2017/01/Cognology-logo-colour-300x101.png Jon Windust2015-05-26 02:18:012018-08-27 11:07:25The science of feedback: What is the right frequency for workplace feedback? 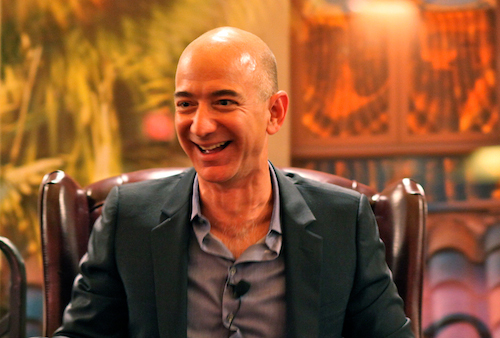 The science of feedback: Is more feedback always better? Is it possible to give too much feedback? A few weeks ago, I had an interesting conversation with a client discussing about whether it’s possible to give too much feedback. While I don’t think the ‘feedback overload’ scenario is common, I do think this is a really interesting topic worthy of further investigation. Feedback is a complicated process. Employees need time to process feedback, take action, and consolidate new skills – humans can also only do so many things at once. 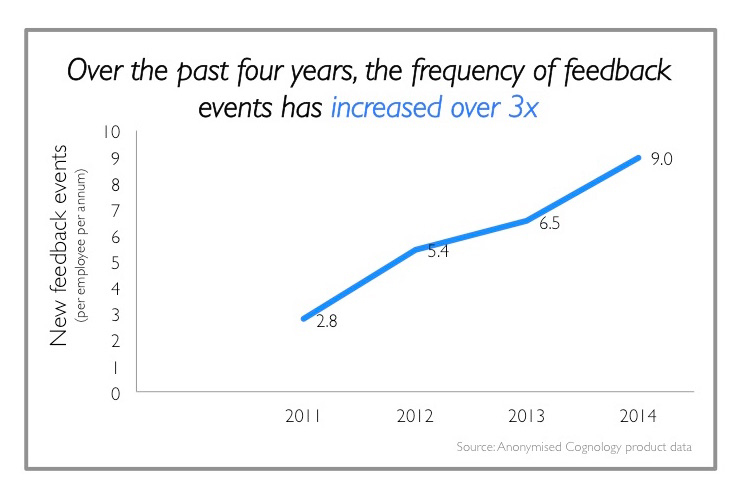 So it seems intuitive that there must be a real state of ‘feedback overload’. I was interested to jump into the research and understand if the science shows that employees really can be overloaded by feedback. 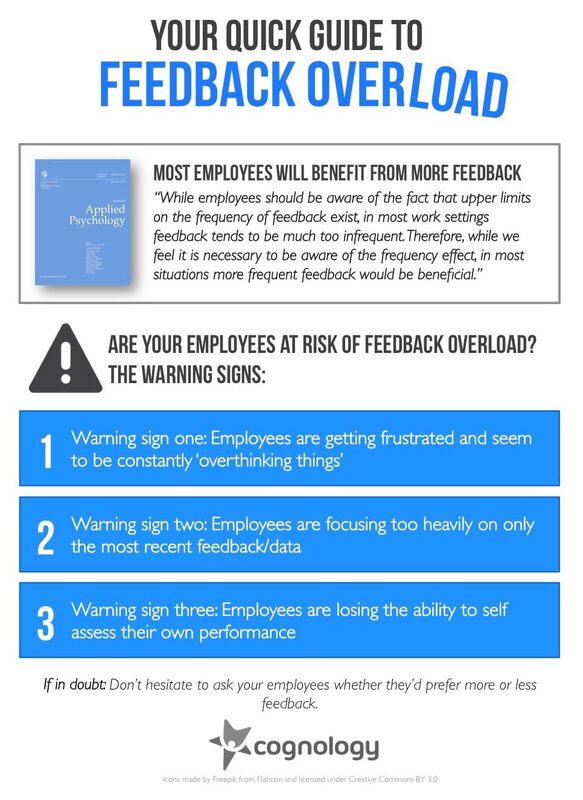 And if so, what are the warning signs that you might be overloading employees with feedback? 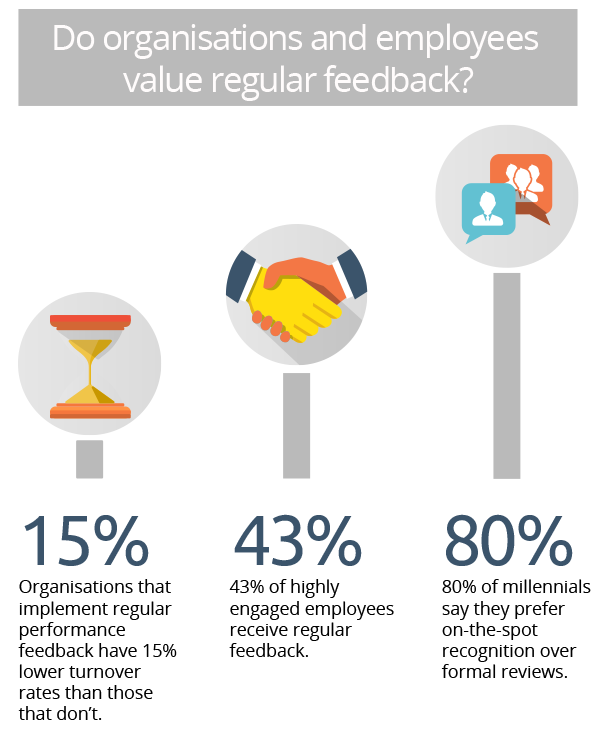 Most employees aren’t getting enough feedback. We recently looked at some research that showed nearly 65% of employees want more feedback than they’re currently getting. While you’re reading this article, it’s worth keeping in mind that it’s much more likely that your employees are suffering from not enough feedback, rather than too much. How does feedback overload happen? Until recently, most academic thinking on feedback has suggested that more frequent feedback leads to better learning and performance on tasks. However, recent study results have showed that feedback frequency exhibits an inverted-U relationship with task performance. Put simply, this means that feedback produces better performance until the individual gets to a state of overload. Each participant was given feedback at a frequency of 35, 17.5, 10, or 5 minutes. In this case, the impact of feedback overload kicked in between a 10 and 5 minute feedback interval. Performance rose with the amount of feedback, peaking when feedback was given every 10 minutes. When feedback was then increased to every 5 minutes, performance significantly dropped. Interestingly, the biggest negative effects of feedback overload happened during the early learning phase when the research participants were busy trying to get a feel for the task. A different study looking at 342 call centre employees showed that each individual has their own threshold for feedback overload. All employees in the study received feedback 27 times a year, based on electronic and physical monitoring of each employee’s calls with clients. Although everyone received the same amount of feedback, some employees felt overwhelmed by the feedback, while others didn’t. I’ll state again that for most employees, you’re at a far greater risk of not providing enough feedback than providing too much feedback. The effects of feedback overload tend to be most pronounced when you’re in an early learning phase trying to get a feel for the task. You’ll know what this feels like if you’ve ever been coached on how to ski, surf, play golf (or any other reasonably complex sport) by someone who’s reasonably good, but isn’t an instructor. The untrained instructor can tell you plenty of things that you’re not doing right. But you’re so busy trying to fix your grip that you’ve forgotten about your feet. And what was it you were meant to be doing with your hips? In this scenario it’s easy to get into a state of overload where you’re simply ‘overthinking’ things. 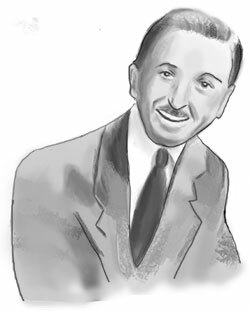 Fundamentally, employees should always feel that they know which ‘levers’ they can pull to improve their performance. Good feedback should reinforce the most effective ‘levers’ that employees have to improve their performance right now. Feedback overload complicates this by introducing too many new potential ‘levers’ to be prioritised and thought about simultaneously. 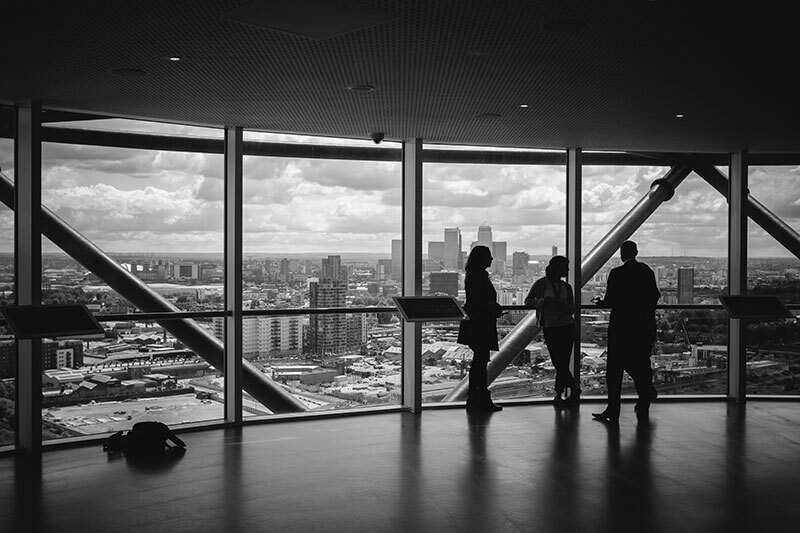 Today’s business environment features a huge amount of random noise. In this environment, giving too much feedback at short intervals can lead employees to over-focus on the most recent (and noisy) data, and miss the longer-term trends. This is important because employees will always treat their most recent feedback as the most important. (If you’re interested, you can read more about the salience and incorrect prioritization of recent feedback here). Because employees will prioritise based on their most recent feedback, a typical sign of feedback overload is rapid swings in priorities, even on a weekly basis. In this scenario, you’re just not giving employees enough time to understand what’s truly important and change their behavior, before you impose a new priority in your next feedback session. Whilst managers should have a significant role in performance ‘calibration’, it’s never your job to judge employees own performance for them. If your employees become completely dependent on you to assess whether they’ve done a good job, it’s a sign that you might be overdoing it with feedback. As I’ve discussed in this piece, feedback overload is real. It is something that all managers should be aware of. But fear of feedback overload should never stop you from delivering regular and meaningful feedback (unless you’re seeing clear signs that you might be overdoing it). One final test if you suspect that you might have overdone it with the feedback – simply ask your team. If your people are genuinely suffering from more feedback and guidance than they know what to do with, they’ll almost certainly tell you. People are generally pretty honest about whether you’re helping or hindering their performance. https://www.cognology.com.au/wp-content/uploads/2015/05/Is-more-feedback-always-better.gif 210 210 Jon Windust https://www.cognology.com.au/wp-content/uploads/2017/01/Cognology-logo-colour-300x101.png Jon Windust2015-05-20 02:51:532018-12-21 10:09:46The science of feedback: Is more feedback always better?